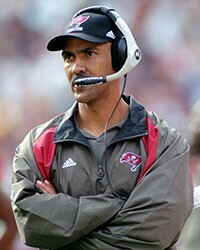 Dungy coached the Tampa Bay Buccaneers from 1996-2001, and led the Bucs to 4 straight playoff appearances (1998-2001), including a loss to the Rams in the 1999 NFC Championship game. He moved onto to Indianapolis and led the Colts to six straight playoff appearances (10 straight counting TB) and the Super Bowl XLI win over the Bears following the 2006 season. He retired after the 2008 season.